Distant galaxies are dominated by gas and stars - where is the Dark Matter? New observations of galaxies show they are dominated by “normal” matter, with so-called “dark matter” present in much smaller quantities than expected. By mapping the orbital speed of gas around the centre of six galaxies University of Bath researchers, working with an international group of scientists led by the Max Planck Institute for Extraterrestrial Physics, found that the orbital speed drops with distance out from the centre – unexpected evidence that dark matter is only present in small quantities. Dark matter is a mysterious and unknown form of matter detected in the Universe through its gravitational pull. Ordinary matter makes up about 4-5% of the Universe, but dark matter is thought to make up to nearly 30% of the Universe's mass. The findings are supported by observations of more than 200 further galaxies, where estimates also indicate a high normal, or “baryonic”, mass fraction and are published in a paper in the journal Nature with three accompanying papers in the Astrophysical Journal. Dr Stijn Wuyts from the University of Bath's Department of Physics, a co-author on all four papers, says: “We have placed galaxies in the distant Universe on a scale and weighed them. The question we address is how the typical mass of a galaxy breaks down into different components; stars, gas, dark matter, and whether this breakdown of the mass evolves through cosmic time. You can do the arithmetic to reveal the total mass present. Subtract from that what we see in the form of stars and gas, and there really is not much room left for dark matter within these early disk galaxies. Many studies of galaxies in the local Universe have shown the existence and importance of so-called dark matter. While normal, or baryonic, matter can be seen as shining stars or luminous gas and dust, dark matter interacts with normal matter only through gravity. In particular it is responsible for rotation velocities that are constant or increasing with radius, in spiral galaxies. The team of astronomers obtained deep imaging spectroscopy of several hundred massive, star-forming galaxies in the distant universe. This allowed the researchers to extract the rotation curves, which give indications of the mass distribution out to the edge of the visible disk for both baryonic and dark matter, 10 billion years ago. For six galaxies with the highest quality data, the scientists were able to obtain individual rotation curves, while they used a novel stacking approach for about 100 galaxies to constrain an average, representative rotation curve. Both effects seem to increase with redshift, which means that they are more important at earlier cosmic times. The results suggest that in the early Universe, about three to four billion years after the Big Bang, the gas in galaxies had already very efficiently condensed at the centre of large dark matter halos. 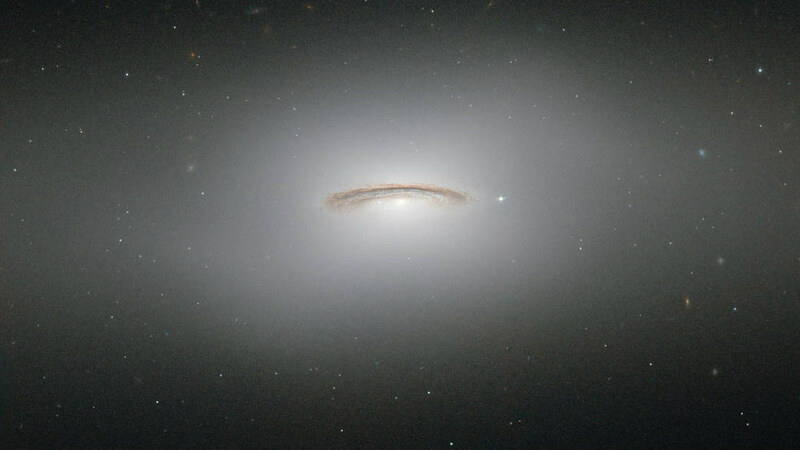 It took many billion years longer for the dark matter in the halo to condense as well, so it is not until later times that we see its dominant effect on the rotation velocities of modern disk galaxies.